If you've been following me on Instagram for a long time or if you have stalked my social media accounts for awhile, you'd know that my shoe collection is pretty big. My favorite kinds of shoes to wear are sneakers and booties. While they do provide more comfort over other shoes like heels and pumps, it is still pretty impossible to escape getting calloused rough feet. After a long day of walking, I often find myself picking at the base of my heels because of all the dead skin peeling off and my fingers just can't stay away from peeling skin. I'm pretty sure you know what I'm talking about ;) but it is definitely not a good idea to be peeling the skin because I always end up digging too deep and peeling off a deeper layer that hurts. Plus, the new skin that grows back tends to be harder and rougher. 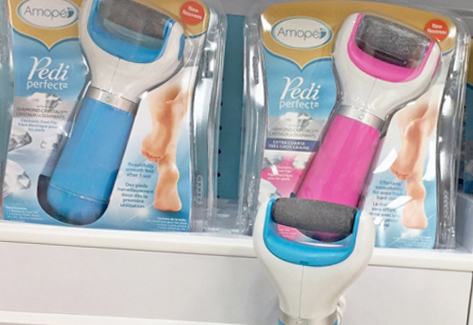 The award-winning Amopé Pedi Perfect™ Electronic Foot File is a battery operated file that smooths feet quickly and easily. Seriously, all you need to do is fire it up and file away the hard skin from any part of your foot. It is ergonomically designed to access the curviest contours and the roller heads are actually replaceable if you find that you need a new file or want to try another file. They have three types of files - coarse for regular skin, extra coarse for hard, calloused skin and soft touch for a smooth finish. The blue ones that you find in store are equipped with the coarse file for regular skin while the pink ones have the extra coarse file. The files are made from finely ground diamond crystals but it is gentle and safe at the same time. I know it may sound scary or rough but it is actually very gentle on the skin. Personally, I like how the diamonds add so much sparkle to the file and it just makes me so happy to use it. Enough talking! Let's put it to the test! After: Visibly and physically smoother and softer! Goodbye dead skin and hello #SoftFeetAllSummer! Now you don't need to be embarrassed or conscious about your feet when you wear sandals or heels throughout summer! I also picked up the Amopé Pedi Perfect™ Electronic Nail File because I do my nails pretty often and I love to keep them in shape. I hate the feeling of ridges on my nails so I buff my nails almost every 2 weeks because they grow out really fast. I've been using the conventional nail buffer block which is great, but I won't deny that I get lazy to do them sometimes. It simply requires too much effort to buff all 10 nails and I always give the least effort to my ring finger and pinky. The nail file is also battery operated and comes with three different replaceable heads as part of a 3-step buffing process. The first one is a nail file, followed by a ridge remover and a shine buffer. After: Smooth and shiny nail! Don't even need to use any nail polish to get that shine. So this electronic nail file has definitely simplified my routine because I now have this to perform the buffing motions for me. Just switch it on and buff your nails while watching some YouTube videos! I also love how the shape of the nail buffer allows you to easily reach the corners and edges of your nail so you fully cover the whole nail bed. That is something that I find hard to achieve with a manual nail buffer. Definitely shifting to this nail buffer from now on! Buffed nails are amazing. I love the natural healthy shine it gets and you don't even need to use nail polish! So if you have never tried it out before, this is something I would highly recommend to all you people who love taking care of your nails. 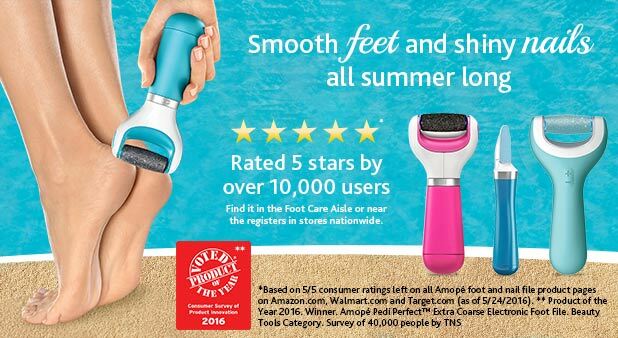 From now 14 August 2016 till 28 August 2016, you can get $15 off a nail/foot file or $25 off two Amopé devices with these coupons at your local CVS stores: https://goo.gl/9DKiky.